“Time heals all things” is the common wisdom. Religion teaches us to deal with the inexplicable. Medicine helps us deal with the physically unbearable. But there is no ameliorative for unexplained injustice. It seems impossible, with the problems in the world to group what happens in a professional sporting event with the desperate upheavals that past human experience has had heaped upon it, and yet, New Orleans, as always, is a special place, immune to the usual rules of dialectic. Going into the 2018 NFC Championship game against the Los Angeles Rams much could have been said of the unique bond that the New Orleans Saints, the football team as a franchise and its players, have with the city of New Orleans. 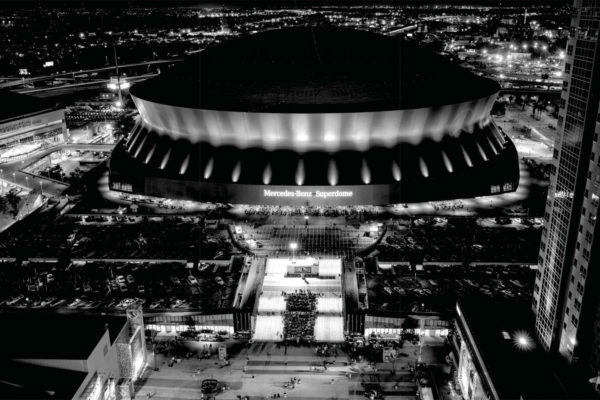 There was a time, when the Saints played in its state-built pleasure dome, in the 1970s and for a good time afterward, like every other sports team in America, in an antiseptic all-sports facility, with its stars and its made-for-TV branding. But then something happened: First it was Hurricane Katrina, which seemed to knock the city out of its centuries-long slumber, and then, hard on its heels, the arrival of Sean Payton and Drew Brees. The city and the team melded and the incongruity ceased; this regime “got” our unique city. The music, the culture, the emotion, the rhythm, the desperate passion that unfolds on a whim during every Carnival season — and at certain surprising timestamps in between — eventually, in a cathartic release the franchise won a Super Bowl and the symbiosis was complete. And then every fall and winter, Sunday was a reunion with the city and the team joining in the Dome to help each other. This is not a city that asks for anything. It never sought permission to be and frankly according to the terms of nature should not be here today. And yet it survives and continually lives in the moment, a quality so many visitors instantly love. And so it was at the NFC Championship game on a wintry Sunday that perhaps the best team the New Orleans Saints had ever mustered stood on the brink of victory and the sort of resolution that so many yearned for – a trophy presentation, national recognition, a matchup for the ages between Brees and one Tom Brady, and an overdue in-person reunion with the commissioner of American football, Roger Goodell, the presider of a billion-dollar industry, for whom New Orleanians had long felt a very particular confliction of gratitude, for saving the team for the city, and for ripping it apart, in the scandalous “bounty-gate” episode of 2012. Situated at the 13-yard line of the Rams, on third down, with just under two minutes left, the Saints surprised the Rams by placing halfback Alvin Kamara, who had already generated 11 receptions, out wide, while sneaking wideout Tommylee Lewis into the backfield behind Brees. The play was a wheel route wherein Brees would throw to a specific spot that Lewis would run to. Ever the technician, Brees threw a perfectly timed laser shot that was destined for Lewis’ hands chest high. The Rams’ defensive backs were completely out of place, and, just before the snap could be seen, a bit confused. Rams cornerback Nickell Robey-Coleman had mistakenly tracked Kamara instead of Lewis and so was on the completely opposite side of the field from where he should have been. Upon Brees’ snapping the ball, Robey-Coleman, perilously out of position, frantically streaked across the field to catch up to the man he was supposed to be covering, Lewis, with no ability to follow Brees’ throwing motion. Instead, Robey-Coleman chose to take an angle and destroy Lewis’ ability to catch the ball. Like a missile hitting another missile in flight, Robey-Coleman struck Lewis before the ball could reach him, striking him in the head and knocking him entirely out of bounds as Lewis’ facemask ground into the turf and his mouthpiece flew out. Stunned at this as though having witnessed a mugging in broad daylight, the home crowd froze in time awaiting the inevitable call – there had been interference, and if not that then a personal foul for targeting. Either penalty would have meant a fresh set of downs and almost certainly the ability to kick a game-winning field goal with very little time left for the Rams to respond. No call came. Down Judge Patrick Turner, wearing No. 13, was most directly on top of the play standing perhaps five yards from the actual event. As Robey-Coleman obliterated Lewis, Turner reached for the yellow flag in his belt, but he paused as he looked downfield to his crewmate, Side Judge Gary Cavaletto, wearing No. 60. According to the NFL Operations’ website, the Side Judge “makes sure widest receiver on nearest side of field is able to run his route without defensive interference.” Nonetheless the Down Judge’s duties also include watching for pass interference. What effectively happened was that two different officials observed two separate fouls and yet both officials did not call the fouls. That critical failure was determinative, as ESPN’s analytics team estimated the Saints would have had a 98 percent likelihood of winning if the flag had been thrown. The NFL is a multibillion dollar industry, featuring worldwide telecasts of this game and others, affecting millions in more income to host cities like New Orleans, and yet cannot explain why a call was made, nor specifically by whom or how. And yet competitive integrity is at the root of the popularity of the sport, as it claims to distinguish itself by its myriad array of rules garnered every Sunday with a thicket of technical explanations. It is apparently a mirage. That is an issue for the sports industry, for networks, and maybe even for politicians. But for a city so blessed, and cursed, by intangibles, this alone, this core irrationality arising in the face of what was a truly mighty passionate effort to drag its team into the world’s biggest game by sheer force of will and energy, is what is so disturbing. On one given Sunday, a community so bound by a resolve big enough to overcome disaster and nature was defeated by the insane banality of bureaucracy, and that is a puzzle that may never stop being vexing, no matter how much time passes.